Alright, so this review reflects how much I went overboard on the whole "treating yourself" this holiday. I am now on ViSalus to lose the many pounds I gained trying out delicious food. Just writing this has me almost drooling at the site of these delectable treats from Sweet Synergy. How I long for another melt in my mouth truffle, but that is just the sugar talking! I'll just enjoy the ever so sweet memory of it all..
Sweet synergy was sweet enough to provide me with samples of my choice. These were the ones that tempted my taste buds the most and not one of them was a disappointment! The cake truffles came packaged lovely in pretty boxes tied with a silver bow. I can't say enough about presentation and how much I love eye candy. They were pretty much ready to gift anyone on the spot. This flavor was among my absolute favorite. It's a lemon with fresh grated lemon peel baked into it. Then it is dipped in a white chocolate. The combination was divine. I love white chocolate anything fruity, so why not mix the two. The tartness of the lemon in contrast to the chocolate belonged together in my mouth. The name says it. It was hard to fight the temptation to try this. Of course temptation won me over, look at the thing. There is nothing in this, but chocolatey chocolate topped with you guessed it, chocolate. Hershey dark chocolate devil's food pudding are baked into it. If that's not enough, it's then dipped into dark chocolate. Yeah, this is definitely going to please any chocolate lover. This was so rich and decadent, almost too much so, but not quite. I gobbled it down. This is a light key lime cake. I LOVE key lime anything. With lime zest and lime juice infused into it, with a hint of lemon emulsion. It's also blended with freshly made lime curd. Then it takes a bath in chocolate like all the others. This was bathed in white chocolate, but it's usually done in dark. This truffle was named in honor of all the breast cancer survivors, which I thought was sweeter than her confections. That's not really possible, but you get what I mean. It is strawberry cake that is baked with pureed strawberries, infused with a hint of strawberry oil and blended with strawberry curd. Then it takes it's bath in white chocolate. Again, fruit and white chocolate really need to be fused more! Well, it's named right. I get joy from mounds of coconut and this was just that. Coconut is one of my favorite fruits by far. This is a Coconut Cream cake, blended with coconut pudding and freshly shredded coconut. It's then bathed in chocolate and topped with salty dark chocolate almonds. This one is a red velvet cake infused with cocoa and rich cream cheese frosting. It's then dipped in your choice of white, dark, or milk chocolate. I'll take all 3, yes please. This one is named spot in too. It was indeed a harmonious mix of ingredients. Butter Pecan cake is mixed with toasted pecans and butter cream icing. Then it bathed in white chocolate and rolled in more toasted pecans for the double the harmonious experience. I enjoyed this one a lot and i am not huge fan of butter pecan cake. I should say, I've never actually had it and after this, I am definitely going to try some again. Lastly is another one I have never tried and ended up really liking. A potato pie desert is something i've never had. I've had sweet yams and cinnamon on potatoes, but this was something else. Another form of cake I haven't tried. It is made with old fashioned sweet potato cake. They use fresh cooked yams seasoned with cinnamon, spice, and everything nice. Then it is bathed in a white chocolate, which I definitely have not tried in combination with sweet potato! This was the perfect taste for the holidays! All of her truffles were mouth wateringly taste bud tantalizing and I'm glad to be done with this review, only for the mere fact that it is really tempting me to eat something sweet, but I won't come close to these beauties! If you want to give your sweet toothed significant other or loved one a gift to remember, I would highly recommend this. It's the sweetest way to say I love you on Valentines day. If the cake truffles don't suit you, check out her many other confections, such as the sweet heart truffles and berries pictured above. 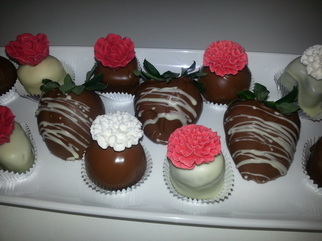 Berries bathed in chocolate and gorgeous edible decorations!